A very bright meteor blazed through the skies over Lake Michigan at around 1:25 a.m. local time on Feb. 6, 2017. 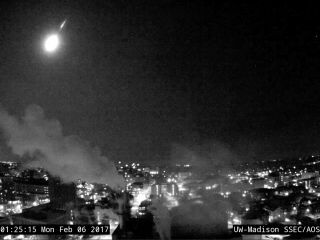 The fireball's flight was captured by a camera on the campus of the University of Wisconsin-Madison. A brilliant, bright-green meteor blazed through the sky just north of Milwaukee early this morning (Feb. 6), and likely sprinkled space rocks into Lake Michigan. The falling space rock likely burned up in the sky about 10 to 20 miles (16 to 32 kilometers) north of Milwaukee, or about 100 miles (160 km) north of Chicago, according to the American Meteorological Society (AMS). More than 220 people have filed reports with the AMS claiming to have seen the fireball at about 1:25 a.m. CST (2:25 a.m. EST/0725 GMT), according to the NASA Meteor Watch Facebook page. Jim Dexter of the Lisle Police Department in Lisle, Illinois saw a meteor moving through the sky, and quickly turned on the dashboard camera in his car to capture the event. One video of the fireball was captured by Jim Dexter of the Lisle Police Department in Lisle, Illinois. Dexter saw the bright flash moving through the sky, and quickly turned on the dashboard camera in his car to capture the event. "In this profession, we see so many things that the public doesn't" get to see, Dexter said in a written statement from the Lisle Police Department. "Sometimes that's good sometimes that's bad. I'm just glad that in this instance I was able to capture this for everyone to see." Another video of the fireball streaking through the sky was captured by a camera on the roof of the University of Wisconsin-Madison's atmospheric, oceanic and space sciences building. The various videos of the event reveal that the meteor was exceptionally bright, which means it qualifies as a "fireball." "Cameras in the region indicate that the meteor originated 62 miles [100 lm] above West Bend, Wisconsin and moved northeast at about 38,000 miles per hour [61,155 km/h]," a post from the NASA Meteor Watch Facebook page states. The meteor appears to have broken up into smaller pieces "about 21 miles [34 km] above Lake Michigan, approximately 9 miles [14 km] east of the town of Newton," the post says. The meteor also created a sonic boom, which occurs when an object moves faster than sound waves in Earth's atmosphere. Hankey said meteorites create a sonic boom only when they remain intact long enough to travel to relatively low altitudes, where Earth's atmosphere is sufficiently dense. Most fireball meteors do not create a sonic boom, Hankey said; they burn up or break up into small pieces before they reach those low altitudes. All of this information has helped meteor scientists get a better understanding of what this falling space rock looked like before it hit the atmosphere. It was likely an asteroid fragment "weighing at least 600 pounds [272 kg] and 2 feet [0.6 meters] in diameter," according to the NASA Meteor Watch page. Hankey said he thinks that's a low estimate for the meteor's size. Based on radar data, it is likely that bits of the meteor reached the ground (these are called meteorites), Hankey said. However, the space rocks would have been sprinkled over Lake Michigan, which means they can't be collected for study, he added. A meteor large enough to leave meteorites on the ground typically flies over the U.S. about three or four times per year, Hankey said. The meteor also might have been spotted via radar by the National Weather Service's Milwaukee office. The office tweeted a radar picture showing the possible location of the meteor over Lake Michigan at 1:31 a.m. CST (0731 GMT). Sarah Marquardt, a meteorologist at the Milwaukee office, told Space.com that the radar instruments likely identified the space rock as it broke up into very small pieces. The radar instruments are designed to detect primarily water droplets, but the radar showed that the object or objects in that area were not made of ice or water, she said. If you have seen a fireball, you can report it to the AMS here. Editor's note: If you have an amazing image of the fireball, or any night-sky view, that you'd like to share, you can send it to managing editor Tariq Malik at spacephotos@space.com.